This cruise consisted of two back-to back segments – the first a seven night voyage from Civitavecchia to Venice and another week-long segment from Venice to Piraeus. Each of the segments could be purchased as a separate cruise. The cruise coincided with the return of the Queen Victoria’s return to service following a multi-million-dollar refit. 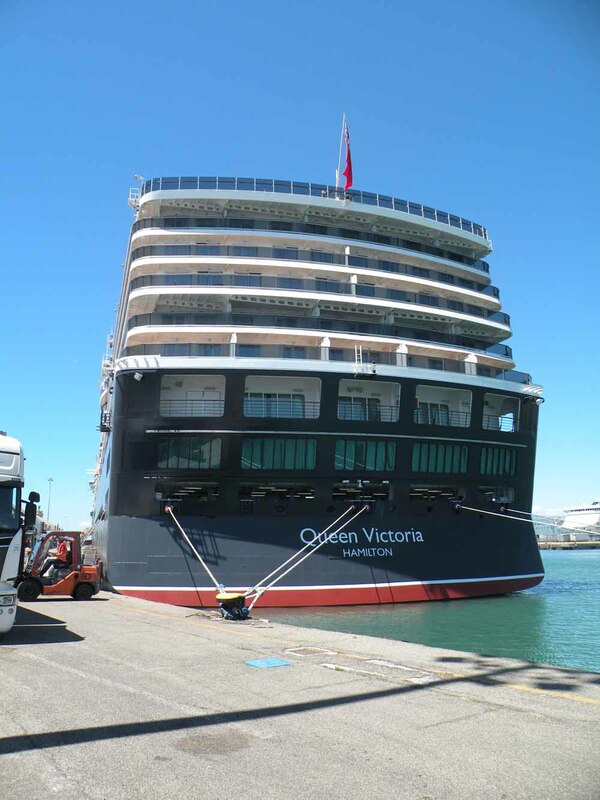 On May 5, 2017, Queen Victoria had entered a dry dock in the Fincantieri shipyard in Palermo. The purpose of the refit was to incorporate into Queen Victoria certain changes which had been made to its sister ship, Queen Elizabeth. Queen Victoria emerged from the shipyard 30 days later. Among the changes made were (1) the conversion of the Chart Room on Deck 2 to the Britannia Club Restaurant, (2) the conversion of the Café Carinthia and the Champagne Bar into a new Chart Room, (3) the conversion of the nightclub, Hemispheres, into the Yacht Club, and (4) the extension of the aft portion of Decks 6, 7 and 8 to add 33 more staterooms and to increase the lounging area around the Lido Pool on Deck 9 aft. Nine staterooms were added to Deck 6, four balcony staterooms and five inside staterooms. Ten staterooms were added to Deck 7, six balcony staterooms and four inside staterooms. Fourteen staterooms were added to Deck 8, eight balcony staterooms and six inside staterooms. In the process, the gross tonnage of the ship was increased from 90,049 as built in 2007 to 90,746 and the passenger capacity was increased from 1,988 to 2,081. The one area where the Queen Victoria still differs markedly from the Queen Elizabeth is the staircase at the entrance to the Britannia Restaurant. On the Queen Victoria, if you enter the staircase on Deck 3, you emerge on Deck 2 facing the exit doors. On the Queen Elizabeth, when you descend the staircase, you emerge directly into the restaurant, thereby enabling you to make a “grand descente” so popular on French Line ships of the past. The changes made to the Queen Victoria during the recent refit enhance the appeal of the ship, without changing in any significant way the ship's overall ambiance. It can now offer the same dining venues as the Queen Mary 2 and Queen Elizabeth. The conversion of the Carinthia Cafe and Champagne Bar into a new Chart Room reflects the popularity of the Chart Room on the Queen Elizabeth 2 and Queen Mary 2. I would not be surprised to see the same change made on the Queen Elizabeth. The lounge space lost in the conversion of the old Chart Room on Deck 2 into the Britannia Club Restaurant did not seem to be missed. The addition of staterooms on Decks 6, 7 and 8 were done seamlessly and do not adversely affect the appearance of the ship. The extra space around the Lido Pool on Deck 9 aft is a welcome by-product of the new staterooms on Deck, 6, 7 and 8. The net effect of the changes is definitely positive. Other than the new Britannia Club Restaurant, most returning passengers will not notice most of the changes. We took an overnight flight to Rome to join the Queen Victoria. We landed at just after 7:00 AM. After going through customs and collecting our luggage, we found the Cunard staff who took our luggage from us. The luggage was transported to the ship by truck, while we and other passengers would travel by motor coach. We were the first passengers to check in and we were told that the first bus to the ship would not leave the airport until 10:15 AM. We went upstairs to the food court and shopping area to while away two hours. We returned to the meeting point at 10:00 AM, where a critical mass of passengers had gathered. We were soon led to the bus and started on our way to the ship. It was a warm sunny day. Twothirds of the way to the ship, we made a stop at a service area. We arrived at the pier at about 11:30 AM and were immediately able to check in and board the ship. Exploring the refurbished ship, the new Britannia Club Restaurant like its counterpart on the Queen Elizabeth, is an intimate, art-deco styled room on the starboard side of Deck 2 just forward of the Britannia Restaurant. The carpeting outside the Britannia Club Restaurant had been replaced by carpeting with a more art deco feel. Moving forward on Deck 2 from the Britannia Club Restaurant, we saw the new Chart Room. It looked very similar to the way it looked in its former life as the Café Carinthia. The old Champagne Bar has now been incorporated into the Chart Room, so that there are now two bars at either end of the Chart Room. We also visited the Yacht Club, formerly called Hemispheres, which had been entirely redecorated. The first full day of our voyage was a day at sea. That evening was the first of four formal evenings during the voyage, each held on a sea day. We attended a party in the Queen’s Room hosted by Commodore Christopher Rynd. The Commodore announced that there was a full complement of passengers on board, of whom the vast majority, more than 1,200, were British, followed by approximately 250 Germans and 200 Americans. Our first port of call was Malta. The entry into the harbor of Valletta was quite impressive, with the fortifications looming on either side. It is easy to understand how it withstood a siege by the Ottoman Turks in the Middle Ages and attack by the Germans in World War II. 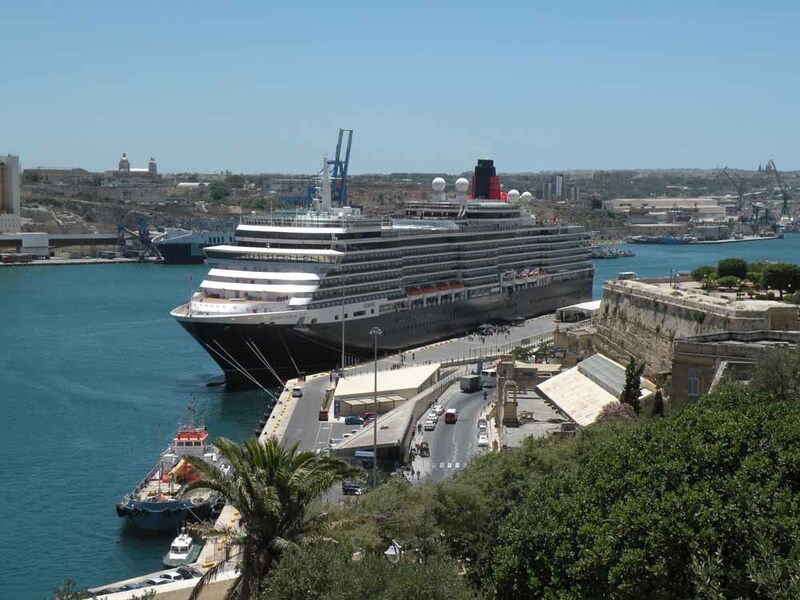 The Queen Victoria was the only cruise ship in port, docked below the high plateau on one side of the harbor. We took a tour titled “A Tale of Two Cities”. We were first taken by motor coach to the walled fortress city of Mdina, for a walking tour. We were able to take a brief look at the Mdina Cathedral. We then reboarded the motor coach for the ride back to Valletta, where we had another walking tour and visits to the Grandmaster’s Palace and St. John’s CoCathedral, among other places. The next day was another day at sea, This leg of the voyage required the ship to travel at 21 knots for an extended period of time in order to make our next port of call, Kotor in Montenegro, the following morning. The ship travelled smoothly with no vibration or turbulence. We sailed into Kotor through a fjord, with small mountains on each side. The town was at the end of the fjord. We were fortunate to be the first ship to arrive in Kotor, since there is only one pier. Holland America Line’s Westerdam, which arrived after us, anchored in the harbor and tendered its passengers ashore. We toured Kotor on our own, since it is a very small town. The next day we entered the harbor of Zadar, Croatia, where we were the only cruise ship. We docked at the ferry terminal, some distance out of town. We took a tour titled “Discover Zadar on Foot”. After a motor coach ride into town, we went on a walking tour with a local guide and visited a museum. An unexpected bonus on this tour was a visit to a restaurant where we were offered red and white wine, bread and goat cheese and shot glasses of maraschino, a locally produced clear cherry-flavored liqueur. From Zadar we travelled to Venice, where we had two days in port. We docked at Banchina Piave on the Molo Ponente of the cruise terminal. Regent's Seven Seas Voyager was also at the cruise terminal, docked at the Banchina Santa Marta. On our first day in Venice, we took a tour titled “Verona on Your Own”. Although the ride to Verona is only an hour long, the motor coach stopped at a service area, where we wasted close to half an hour. By the time we got to Verona and were escorted from the parking lot over the river to the Roman amphitheater, we were told that we had to be back at the bus in in one hour and fifty minutes. Since the walk back to the parking lot would take a minimum of twenty minutes, we effectively had only one hour and a half to see the sights of Verona. This time period was much too short to do anything but take a fast look at the many places worth seeing and left no time for standing in line to see the Roman amphitheater. On our second day in Venice, the Queen Victoria was joined by five more cruise ships. The MSC Sinfonia docked behind us. The Rhapsody of the Seas and MSC Poesia were docked on the other side of the Molo Ponente at the Banchina Tagliamento. AIDAblu and Costa Luminosa were docked at Banchina Isonzo on the Molo Levante. Seven Seas Voyager remained at the Banchina Santa Marta. Since we had been to Venice several times in the past, we decided to tour the city on our own. Among other things, we visited the Church of Santa Maria dei Frari, with its tombs of Titan and Canova, and the Church of Saints John and Paul. We also took a vaporetto to Murano to see the shops full of multi-colored glass. After leaving Venice, we enjoyed another day at sea. This was the third formal night and the people who had embarked in Venice were invited to a cocktail party in the Queen’s Room. An invitation was not extended to those who had embarked in Piraeus. The next day we docked at the port facility for Dubrovnik. Here we were joined by the Seabourn Odyssey, which was moored ahead of us. Cunard had arranged shuttle buses into the city. Strangely enough, these buses were not free to everyone. Those who had booked at “early saver” or “saver” fares had to pay to use the buses. From Dubrovnik, we headed to Corfu. Here we were joined by AIDAblu, Thompson Spirit, Crystal Esprit (which had no balcony staterooms), Costa Deliziosa and Seabourn Odyssey. We took a tour titled “Colonial Palaces of Corfu”. The motor coach first took us to the Achillion, a large white palace, which was built in 1889/1892 by the Empress of Austria. It was sold to Kaiser Wilhelm II in 1907. During World War I, it served as a hospital. It was later converted into a casino and now serves as a museum. The second stop was to Mon Repos, a manor house overlooking the sea. It was here that Prince Philip of England was born. This home contains furniture dating to the period when it was occupied by the family of Prince Philip, but no original furnishings remain. (See separate article). Our next stop was the port of Katakolon, where we were joined by Rhapsody of the Seas, Star Flyer and Norwegian Star. This port is the starting point for tours to Olympia. Since we had previously visited this site, we took a short stroll through the small town and spent most of our time on board the ship. We enjoyed another day a sea after leaving Katakolon, before arriving in Heraklion, Crete. The only other notable vessel in port was the Minoan Line’s Festos Palace. We took a tour titled “Knossos, a Minoan Miracle”. It began with a motor coach ride to the ruins of the palace of Knossos. Here we were lead through the excavations by a knowledgeable guide. On our return to Heraklion, we were given about 40 minutes to wander around before heading back to the ship. We used this time to visit the superb archeological museum, where many of the artifacts excavated at Knossos are displayed. We also had time to see other local sites of interest. The following day we arrived at Piraeus, our port of disembarkation. Here we saw the Royal Princess, the Silversea Silver Muse, the Star Flyer and P&O’s Oceana in the harbor. Our voyage on the Queen Victoria was a success. We travelled a total of 2,052 miles at an average speed of 18.2 knots. The food and service at dinner in the Britannia Restaurant had been excellent and no menu was repeated during our 14 days aboard. We took most of our other meals in the Lido Restaurant and found the choices to be very good.